Want to know a dirty little secret? Nearly 11% landfill waste thrown away each year in the United States is lumber. One of the reasons lumber is thrown away is because of the time intensive task of removing old fasteners such as nails and screws. As part of our deconstruction process, all lumber that’s brought back to our warehouse is de-nailed before it’s resold. Until 2001, all of that de-nailing was done by hand using end cutting nippers. But in 2001 that changed. 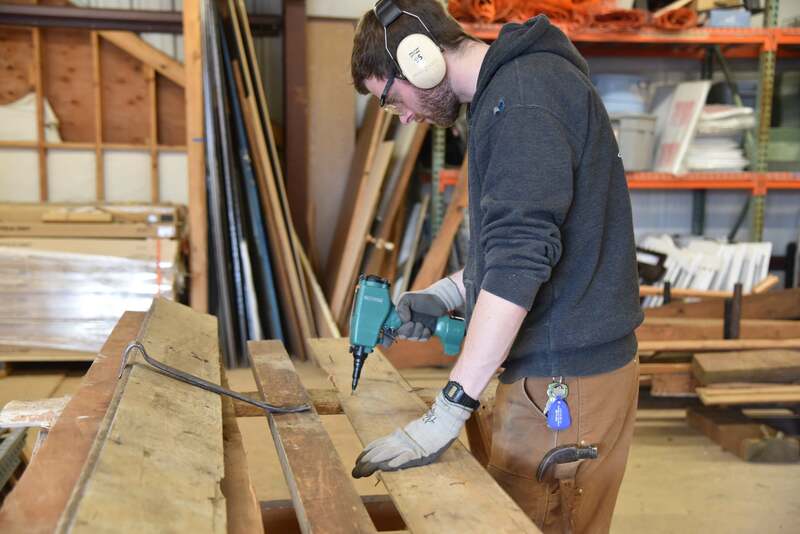 We first learned about the existence of the “nail kicker” or de-nail gun at the 2001 Reuseable Building Materials Exchange Conference in Portland, Oregon. The conference was at the Hilton Hotel and the good people from Reconnx, Inc., set up a demonstration de-nailing station in the parking garage of the Hotel to demonstrate their nail kicker. A nail kicker is a pneumatic nail gun that shoots air to force a nail out of wood. The benefits of the tool for anyone in the salvage industry were immediately obvious. No fancy Hilton property was harmed during the demonstration, attendees were awed, and we purchased our first nail kicker. The nail kicker remains one of our unintentionally secret weapons despite 17 years of use. It allows our salvage crew to quickly process large amounts of wood for reuse, and enables us to protect the integrity of the wood in the process. Contractors are often surprised to see us using a tool they did not know existed. We’d like to share the love and encourage you to check it out if you work with used lumber. The best part – there’s a Reconnx distributer here in Bellingham. Just remember to wear safety glasses and contain your de-nailing area. If you want to see how it works or learn more about the nail kicker, visit their website and watch the video or contact Bellingham distributer David Bennink of RE-USE Consulting. We make it easy to stay in the know with the latest DIY tips, how-to’s, stories, workshops, events, sales and great stuff from The RE Store! Donations accepted until 1 hour before close.